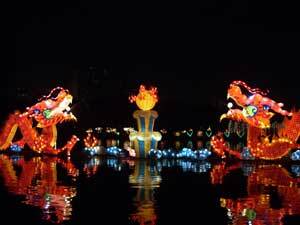 The Mid Autumn festival occurs on the 15th day of the 8th lunar month in China. It celebrates the moon and a fairytale in history. To celebrate this festival many eat moon cakes in the moonlight with family or take part in the lighting of lanterns and dancing. Mooncakes are a pastry filled with walnut, sesame, or red bean filling. This holiday started off based on a fairytale where Hou Yi saved his people by shooting down some nine suns that burned his people. For this he received an elixir for mortality but he didn't want to leave his beautiful wife so he gave it to her for safekeeping. One of his servants forced his wife to drink the elixir and therefore she became immortal and sailed to the moon. Hou Yi was so devastated and one night he thought he saw a reflection of his wife on the moon so he took out mooncakes to present her with gifts. Provides the dates for holidays for the calendar year for China.